Brush steak with oil and bring to room temperature. Cut a few slits in the eggplant and place directly over a gas flame using tongs (see tip if you don't have a gas flame). Cook for 10 minutes, rotating every few minutes as the skin chars and the eggplant softens. Remove to a tray and slice in half lengthways. Scoop flesh into a sieve set over a bowl and allow to drain for 20 minutes. Preheat a barbecue of grill to very hot, season steak with salt and pepper and cook for 2-3 minutes per side for medium, then allow to rest. Finely chop the drained eggplant until it becomes slightly mushy and then place in a bowl with balsamic vinegar and lemon juice, stirring until combined. Gently fold through tomato, cucumber, parsley and half the pomegranate seeds. Season with salt and pepper. Serve with remaining pomegranate seeds on top. If you don't have a gas flame, you can roast your eggplant in the oven. Simply halve it lengthways, drizzle with oil and roast until very tender. To remove pomegranate seeds, start by cutting the pomegranate in half. Then, gently break off pieces of pomegrante and ease the seeds out. If you have a whole scotch fillet you could try this option - try roasting a whole scotch fillet and carve to serve. Brown the roast in a pan then transfer to the oven at 160°C for 1 hour or until it reads 60-65°C on a meat thermometer. 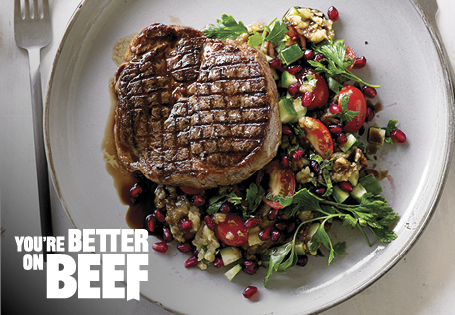 Recipe courtesy of ­­­­­­­­­­­­­­­­­­­­­Meat Lovers Association (MLA).